Construction has commenced on the $1.4 billion integrated residential and resort precinct at Surfers Paradise that will spearhead the Gold Coast's transformation ahead of the Commonwealth Games. Gold Coast City Mayor Tom Tate turned the sod on the first stage of developer The Ralan Group's new Ruby development which will be the first multi-tower masterplanned community delivered in Surfers Paradise, potentially spanning an entire city block. The first stage is being developed on the corner of Norfolk and Oak Avenues adjacent to the existing Paradise Resort, and will comprise 228 Apartments in a 30 storey building, along with 13 two level attached dwellings and extensive road upgrades and landscaping. Construction of the first stage is expected to be completed by the end of 2017, paving the way for work to start on the next phase of Ruby - comprising stages two, three and four. The second tower will feature 477 Apartments in a 60 storey building in tandem with a laneway complete with 1,760sqm of family-friendly restaurants and shops, along with a village green offering space for events and the display of public art. Gold Coast City Council is currently assessing an application for the third stage, which will deliver 489 apartments in a 47 storey building, a second laneway and village green incorporating a 2,543sqm shopping precinct and a 'podium playground' including an activity centre with an ice skating rink, laser tag and climbing wall. The fourth and final stage is also before Council, including 406 apartments across 32 storeys, in conjunction with 358sqm of retail, landscaped areas and pedestrian connections. If all stages are approved it would see the Ruby project become a new neighbourhood centre, bounded by Norfolk, Oak and Birt Avenues and the Gold Coast Highway. The Ralan Group managing director William O'Dwyer said Ruby was a ‘game changer’ which would headline the transition of Surfers Paradise into a world class destination and elevate the level of amenity available to local residents and visitors. “The Mayor and the Gold Coast City Council have created an environment which encourages developers such as Ralan to invest heavily in this city and for that they should be congratulated,” he said. "There is a focus on urban regeneration ahead of the Commonwealth Games and Ruby will lead the renaissance of Surfers Paradise, by delivering a new five star residential and resort precinct which will engage both visitors and Gold Coast residents. 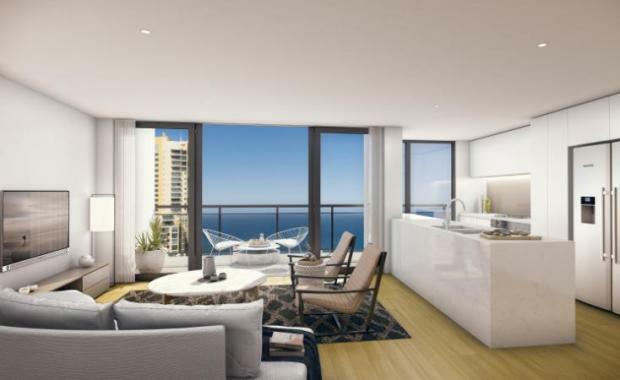 ""There has never been a project of this scale developed in Surfers Paradise, and the rarity of this opportunity has been recognised by local and international purchasers alike who have secured all 228 apartments in the first stage. "Mr O'Dwyer said the Paradise Resort, which occupies part of the 2.48 hectare Ruby site, would remain operational until stage two commenced construction. He said the lifestyle and entertainment facilities to be delivered as part of stages two and three would be a 'significant improvement' on what was currently available at the existing resort. "I have spoken with the staff at Paradise Resort regarding the plans for Ruby and they are in agreement that the new shopping, dining and entertainment precincts included in the project are a much-needed replacement for the ageing facilities at the resort," he said. "At this stage I am planning to retain as many Paradise Resort staff as possible, because they have done an excellent job of building repeat business and understand Surfers Paradise well, which will be an asset to Ruby. "As with any project of this scale, there has also been attention to the needs of the existing community, and to this end, we have worked very closely with Gold Coast City Council to ensure that we adhere to planning regulations in terms of traffic and parking volumes. "The design team for Ruby has been tasked with ensuring that there is ample carparking provided - with a total of about 1607 spaces spread across the first three stages - and ensuring that accessibility is as easy as possible. "Surfers Paradise is a highly walkable neighbourhood, and the site's proximity to the light rail network means that the majority of residents and holidaymakers won't need a car on a daily basis. "Ruby Surfers Paradise is being designed by DBI Design - an award-winning international architecture firm responsible for the creation of landmark buildings including the billion dollar Etihad Towers in Dubai and some of the Gold Coast's most iconic buildings, including Palazzo Versace and the new Soul tower, on the beach in Surfers Paradise.